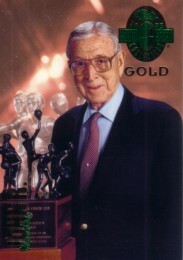 1993 Classic 4-Sport Gold card of the late, legendary UCLA coach John Wooden. NrMt-Mt or better. 1 of only 3900 made. ONLY ONE AVAILABLE FOR SALE.